First cut a 6 3/4" x 9 1/2" piece of Stampin' Up! Tempting Turquoise card stock and fold it in half for the base, a 4 1/2" x 6 1/2" piece of Stampin' Up! Elegant Eggplant for the middle layer and a 4 1/4" x 6 1/4" piece of white for the front layer. Next dry emboss the front layer with a Stampin' Up! 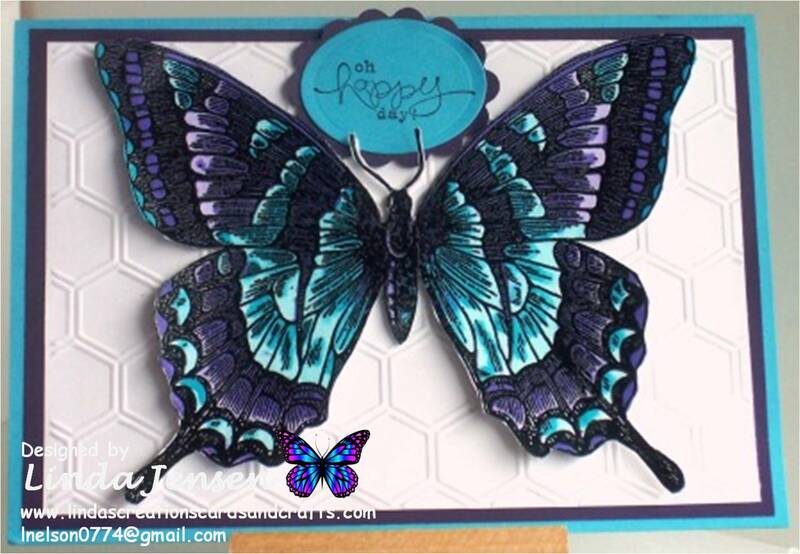 Honeycomb embossing folder, attach it to the middle layer and set it aside. 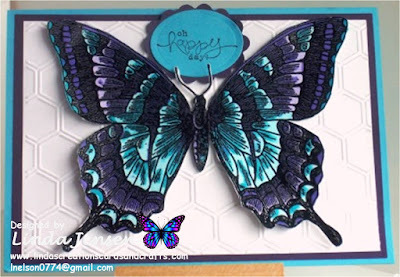 Then heat emboss the swallowtail on white card stock with Versamark ink and black embossing powder. Next water color it with an aqua painter and Stampin' Up! Lovely Lilac and Tempting Turquoise re-inkers. I achieved the shading by adding a few drops of re-inker to two wells on a pallet for each color. I added a few drops of water to one and more water to the other. Then I colored the entire swallowtail in the lighter colors then colored just the shaded areas with the darker colors. When dry I attached the swallowtail to the front layer with mini pop dots. Next cut and emboss the Tempting Turquoise oval for the sentiment with a Spellbinders Classic Ovals die, stamp the sentiment with a stamp from a Stampin' Up! Bloomin' Marvelous set in Stampin' Up! Basic Black ink, and punch the Elegant Eggplant background with a Fiskars scalloped oval punch. Then attach the sentiment to the background with regular adhesive, attach the background to the front layer with mini pop dots. Then just attach the middle layer to the base and enjoy!